Just like the chameleon from which the course takes its name, this Riviera Maya layout winds its way in two large 9-hole loops through an ever-changing landscape of thick tropical jungle and mangrove forest, with a number of man-made lagoons and canals coming into play on all but three of the holes. Laid out by the design company of golfing legend Greg Norman, the Mayakoba-El Camaleon course has had several natural subterranean caves (called cenotes) incorporated into the design (there’s one of the ancient caverns in middle of the first fairway, for instance) in a highly imaginative routing that brings a couple of par three holes right to the edge of the Caribbean Sea. These stunning short holes, tucked in alongside natural dune ridges at the 116-yard 7th and the 155-yard 15th, are the real highlights on the scorecard and they’re played right beside the beach where ever-present sea breezes test the mettle of even the very best of golfers as they stand on the tee. Organized by the Greg Norman Production Company, the Mayakoba Golf Classic has been hosted by the course since 2007 and in the inaugural event, Fred Funk held off the challenge of 131 other professionals to win the title after a playoff, making him the oldest player to win a PGA Tour event since 1975. Its an amazing course with amazing views. The bunkers are fantastic. Played the course in March 2012. This course has some excellent holes, particularly on the front 9. There is a lot of water to contend with and even a couple of caves to play over. A super run of holes from the 5th to the 10th are the real highlight. It was in excellent condition although the greens were on the slow side. There are couple of weaker holes such as the 2nd and the 11th and the par 3's are all short. Well worth a round on your Mexican holiday itinerary, but it is not cheap!! I have played El Camaleon in January 2012 and must say that the course was far better than other courses I managed to play (Playa Mujeres, Riviera Cancun, Iberostar Cancun). Superb service, perfect conditions from tee to green, excellent holes seaside holes and perfect nature. What else do you need for perfect golf? 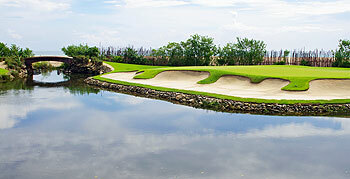 The pro also recommended to play Iberostar Playacar and Riviera Maya courses, if you have more time.